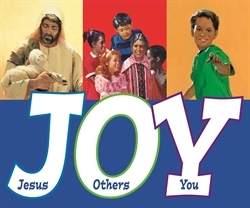 Jesus and Others and You—what a wonderful way to spell JOY! As the children sing the chorus, this cleverly designed visual lets them flip the pages to spell JOY and see an image of what each letter represents. This 12-page book on sturdy cardstock includes the sheet music on the last page. Gr. 4–5.